Ritailan Great Balls of Fire "Tarmo"
It has been silence here now almost year and half, time has gone with our little children and of course with our dogs. But there has been no shows or any other big news so we haven't publish anything here. But now it seems that we'll start with some shows later on this year. Unfortunately our puppy dreams has moved somewhere to the future. Now we finally can introduce our newest family member, welcome Goango Black Label. We made a nice trip to Tartu, Estonia 2* int. 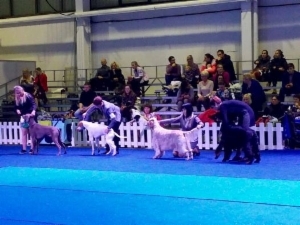 dog show with my friend Katriina Toikka and I took Tarmo with me. On a first day there was judge Domenico di Matteo from Italy who took the breed and Tarmo got nicely BOB, CACIB, CQ and finally GROUP-4 under judge Pekka Teini from Finland, thank you. Oh and now we can also finally say pending C.I.E. On a second day breed judge was Tom Rainey from Ireland and also today Tarmo got BOB, CACIB and CQ. Unfortunately we couldn't stay on group competitions because we had to hurry to the ferry. 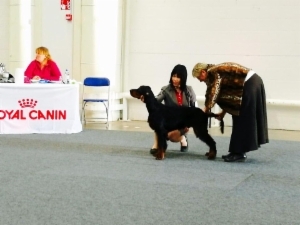 Hiro was at the Finnish Winner Show, puppy class BOS puppy with Price of Honour under judge Irina Poletaeva, Russia. So proud of this little man 6,5 months old.